*For the beginners to the inter-mediate level1. 小: Hane-Jumping technique ; directly before sarting the jumping, the curve should go little outwards(to the right hand side). More cursuve than straight. The Hane Jumping does not need to be big. 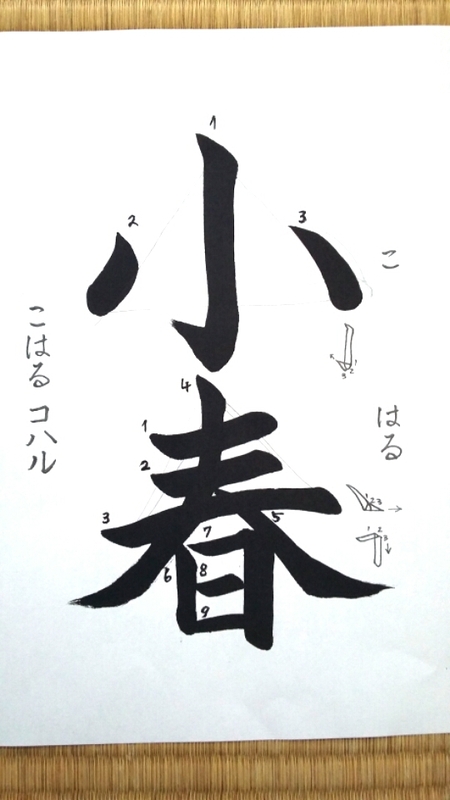 Left Harai: A long streching lune. Just before letting the enegry/pressure out, try to open the hair little bit. Right Harau : Starting calmly rather thin and gradually opening the hair. Always checking the balance. Before you do the Sun”at the end, check the middle line and adjust. The right vertical line of the Sun should be longer.